The history of garden gnomes dates back to the 1800’s in Gräfenroda, Germany. Today, this small village of 3,552 people claims to be the birthplace of gnomes on it’s website. The mythical creatures were thought to come from the Earth, of which they were protectors. In 1847, Philipp Griebel began producing gnomes in Gräfenroda, and that family owned business is now own it’s fourth generation of Griebel family ownership. On a side note, the current owner Reinhard Griebel is looking to retire and the business is in jeopardy unless he can find a successor. The popularity of gnomes skyrocketing when Walt Disney released Snow White & The Seven Dwarfs. Doc, Grumpy, Happy, Sleepy, Bashful, Sneezy and Dopey turned gnomes into international stars with the release of the film in 1937 and over the last sixty plus years sculptors have introduced some comical statues into the marketplace. 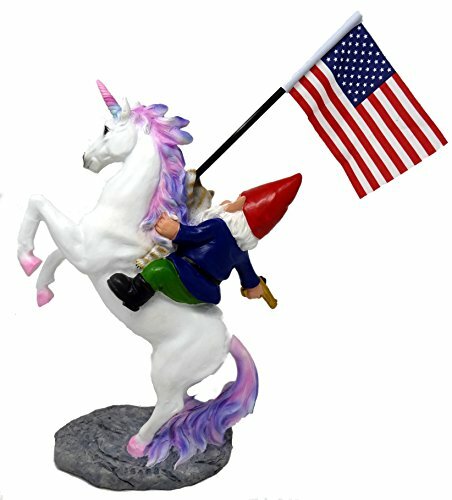 That being said, we’ve put together a list of hilarious garden gnomes that can be purchased online. Don’t forget to share this article on Facebook and to pin it to your pinterest board! A very unique gift: Imagine the look on their face when they realize you didn’t buy a lame gift, but a gift with character? The perfect gift for Christmas, birthdays, Father’s Day and Mother’s Day! Possibly the coolest gnome ever. Perfect for the Jimmy Buffet fan in your life! 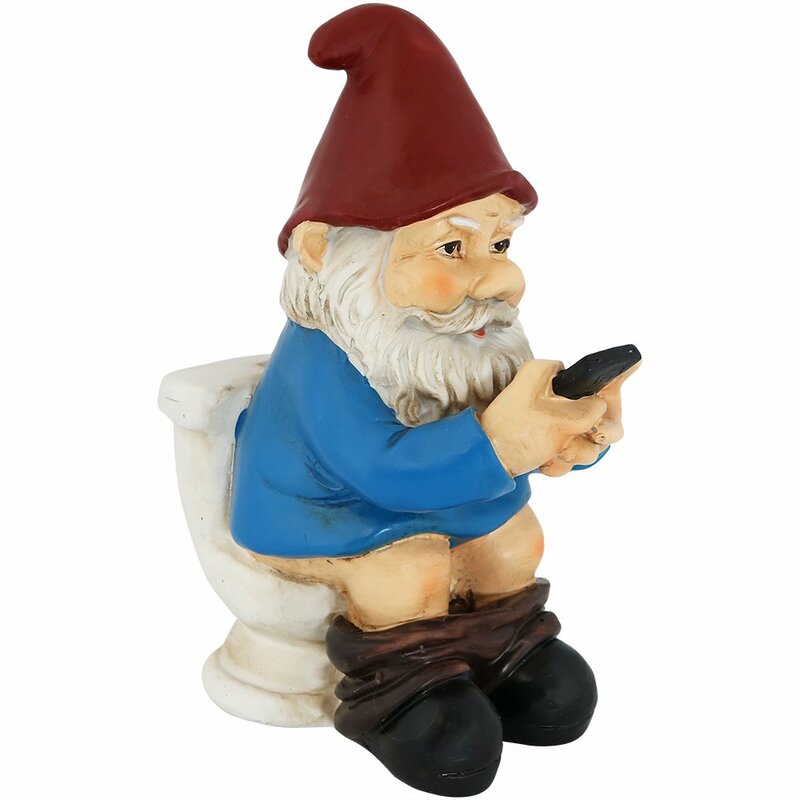 Cody the funny Gnome is so attached to his beloved phone that he can’t help but take it with him everywhere he goes. His little black phone travels with him to the store, to work, to school, and even to the bathroom. Whether he’s calling his mother to check in, sending silly emails to his wife, or scrolling through the latest mushroom soup recipes, you’re sure to see Cody’s eyes glued to his screen at all times. Here he sits upon his toilet throne enjoying some personal time with his mobile device. There’s no sight more humorous than a little man and his precious phone! Welcome guests with this lighthearted statue and enjoy the laughs and smiles that come along with it! 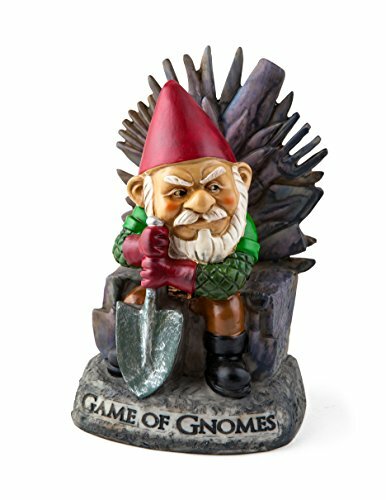 Game of gnomes garden gnome will protect the garden from the throne. Hand painted garden gnome is made of resin and weatherproof. Stands approximately 9 Inch tall. Take a Hike Garden Gnome. Made from resin. Approximately 18 inches tall (46cm). Includes original manufacturers box and packaging. Sporting a vertical smile, Moonie the gnome statue is extending a unusual gnome welcome to all visitors to your home or garden. 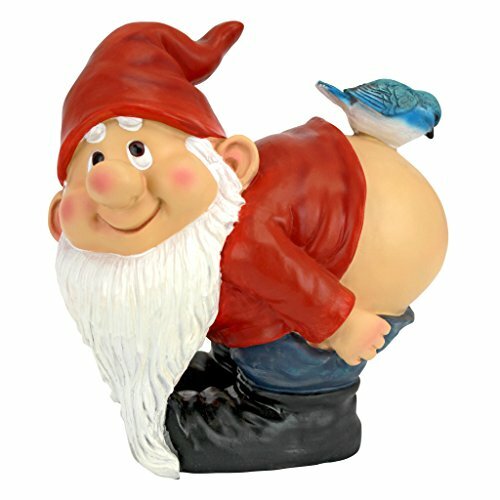 Imaginatively sculpted, 360-degrees so you can admire Moonie’s delightful buttocks, our Design Toscano exclusive quality designer resin garden gnome sculpture is lovingly hand-painted one piece at a time. A great gift and fun conversation piece! 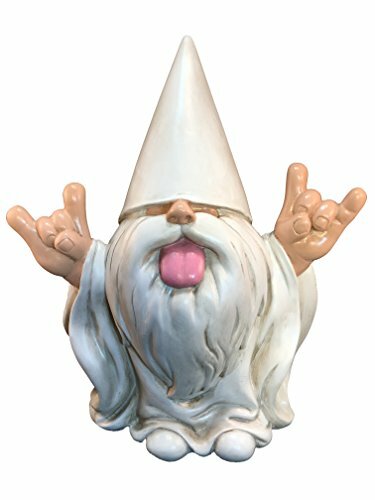 George the “Rocker Gnome” loves to be cool and “Rock On!” This garden gnome will be sure to put a smile on anyone’s face and rock your fairy garden and garden gnomes. George loves to be goofy and make fairies and gnomes laugh all day long. He hangs out with all fairies and gnomes in the magical enchanted kingdom. At times, you will see him playing hide and seek with the little baby gnomes and reading them stories of the enchanted kingdom. 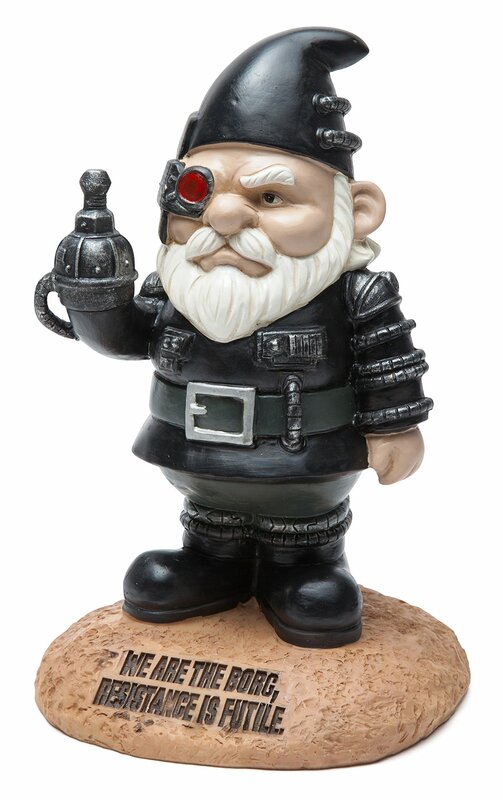 Rocker Gnome will make you smile and make sure you have a “Rock-On” day! George will be sure to put a smile on anyone’s face! 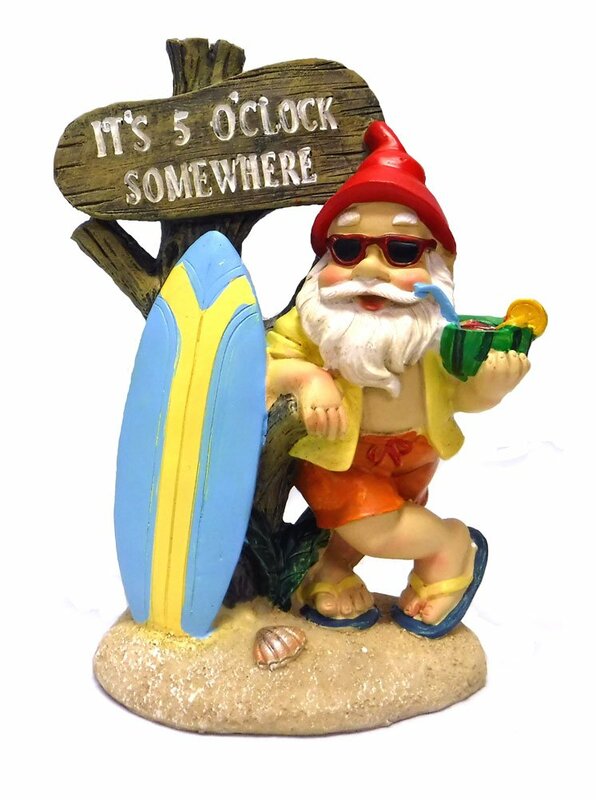 This very cool gnome figurine will be the center of attention in your fairy garden, home or office. George can withstand all the elements of mother nature, casted in high quality resin and hand painted with care by our artists. Place this gnome in your fairy garden and watch the fairies dance next to him at night The design and craftsmanship are amazing and highly detailed. When you look at it closely you’ll appreciate the attention to the smallest features. Enter the world of fantasy and magic with this rocker gnome by GlitZGlam. Large size gnomes are great friends for your garden fairy figures and even get along perfectly well with pixies and sprites. This gnome stands out in the crowd and his design and pose are inviting all with a big welcome. A must-have for your miniature garden! 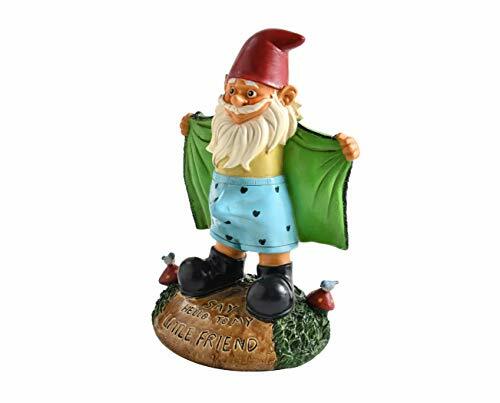 He can be a garden gnome, lawn gnome, decorate a beautiful plant or simply rest on the shelf next to you while you work. Let this happy guy show everybody where the party is happening! Always ready for a good time, this hand-painted gnome holds a frosty mug and his sign points the way to the “Beer Garden”. Especially fun for your next Oktoberfest get together in the Fall. 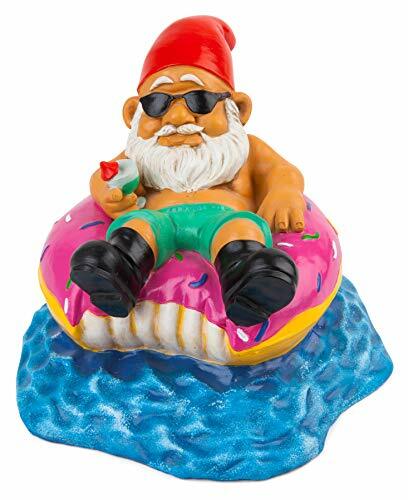 COMICAL LAWN ORNAMENT ALERT: Aboard his donut pool float, this garden gnome is ready for a day full of nothing! BigMouth Inc’s Donut Worry Be Happy Gnome statue is a hilarious take on the conventional lawn gnome and is sure to keep people laughing! 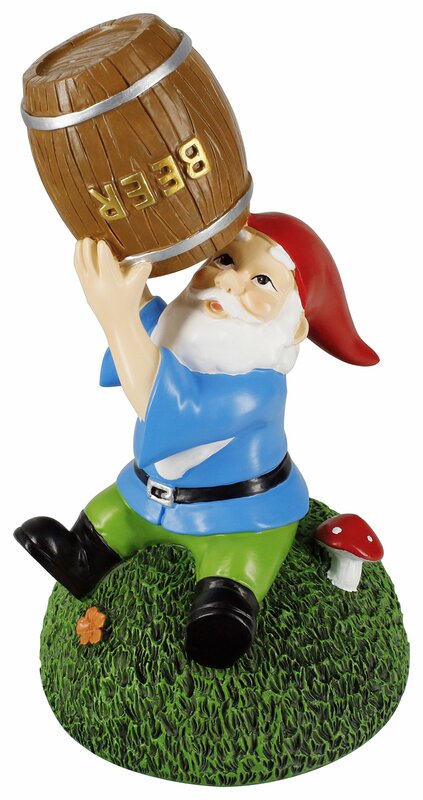 Beer Guzzling Garden Gnome Statue by Gnometastic – Never Drink “A-Gnome” Again! Good til the last drop! It’s always “Happy Hour” with this beer drinking, drunken little gnome. This tipsy fellow will make you laugh inside or outside. Makes a great addition to your garden, lawn decor, porch, yard, home, desk or office. 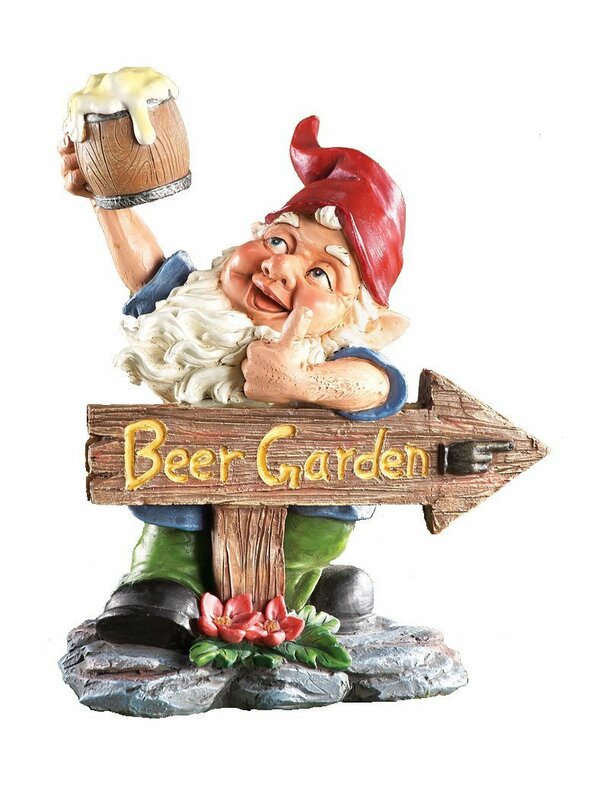 Our funny gnome makes any spot a Beer Garden Party! 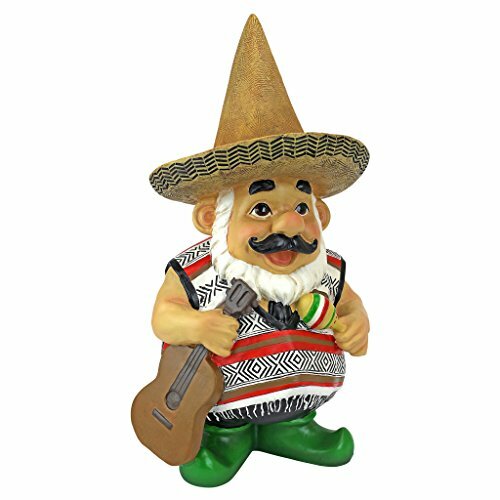 MARIACHI MEXICAN GARDEN GNOME – Celebrate a garden gnome fiesta with Pancho and his maraca, guitar, sarape and zombrero playing a bit of gnome music! 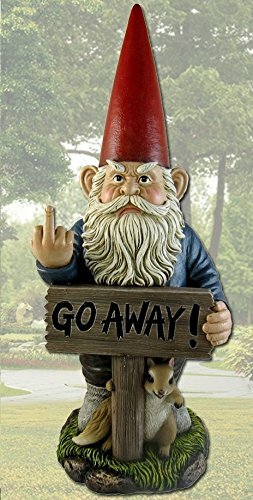 True to tradition, this garden gnome statue with his pointed hat and burly gnome beard makes a great gift for lawn gnome collectors. The Perverted Garden Gnome represents that sketchy man in every neighborhood! He takes one too many walks around the block and wears trench coats during the summer. That’s exactly who the perverted gnome is, except our little buddy has a red hat, bathrobe, and boxers. Smoking Garden Gnome Statue by Gnometastic – Recreationally or medically it’s 420 all the time with this little stoner! “Gerry” the Smoking Gnome is epitome of chill. He’s just smoking his joint and watching the world roll by while spreading TLC with his good vibes and cool demeanor. 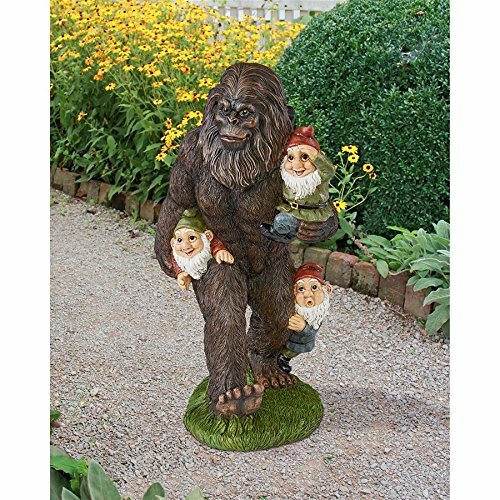 When Sasquatch comes to your garden, give him some room to roam! 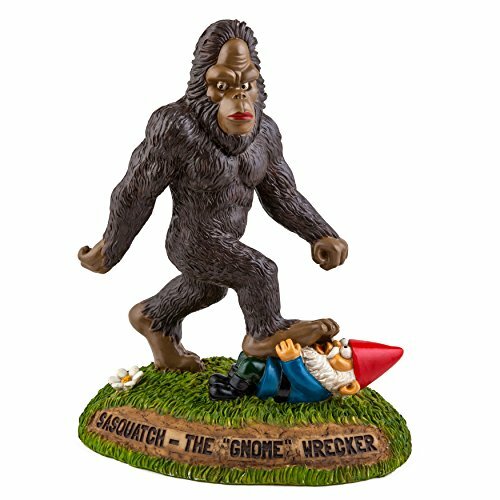 BigMouth Inc’s The Gnome Wrecker Garden Gnome statue is a hilarious take on the conventional lawn gnome. This eye-catching garden statue is a funny lawn accessory that is sure to keep people laughing! 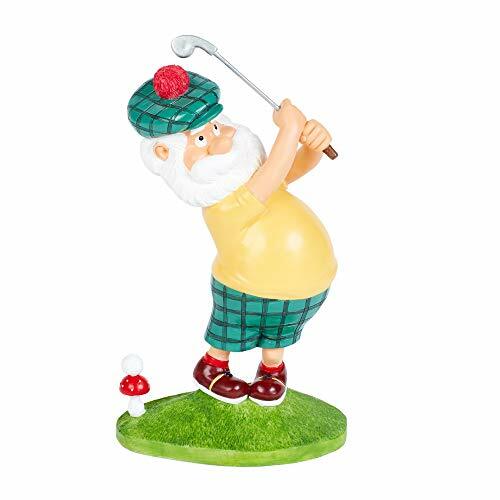 Gnolan the Gnine Iron Gnome Gnolan the Gnine Iron Gnome has been playing golf for more than 50 years. The same round of golf. His handicap is that he’s never gotten his tee shot off the first tee. But Gnolan keeps at it because he’s an optimist who sees the tee as half empty. At least you never have to worry about him breaking a window. It’s been said that Gnolan took up golf not because he thought he would be good at it, but because he already had the tacky clothing. I mean, where else can you get away with green checkered shorts and a yellow shirt? And don’t even get me started on that hat. Gnolan also works part time as a mall Santa. In July. So yeah, he’s not very good at that either. But just look at that determination on his face. Gnolan will remind you each and every day to keep going, no matter how many times you’ve missed the ball of life that you probably can’t see over your belly. 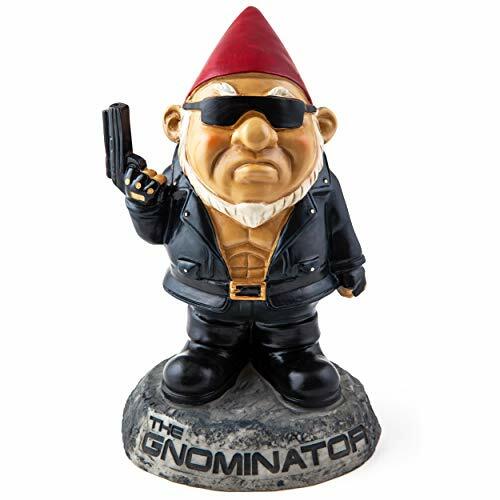 The Gnominator Garden Gnome statue is a hilarious play on “The Terminator,” making it a must-have indoor/outdoor sculpture for any Sci-Fi fanatic in your life! 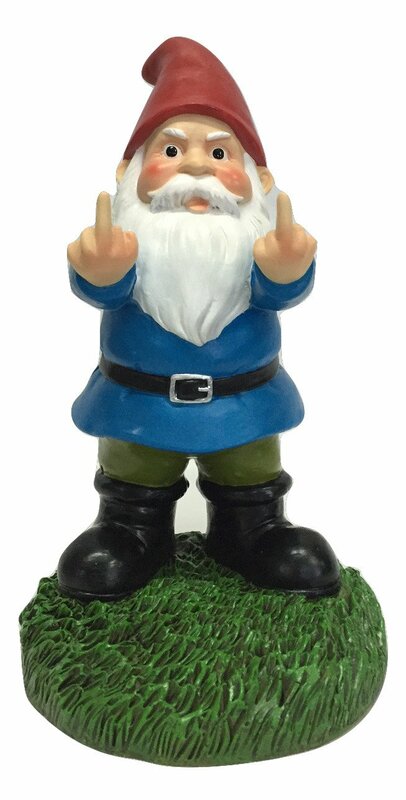 Display your garden decor proudly with this hilarious take on the conventional garden gnome. 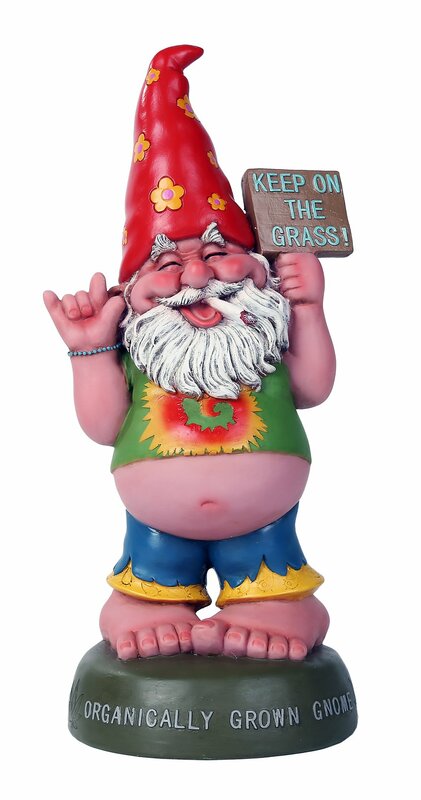 This free loving and proudly home grown pot smoking gnome will definitely be a standout decor in your garden. Sculpted with details from his characteristic pointy elf hat to his gnarly beard, this gnome collectible is cast in quality designer resin and hand painted in bright, attractive colors. We are the Borg, resistance is futile. The perfect lawn gnome for Star Trek fans.